The 5e-version of the first of the Tavern Tales mini-adventures clocks in at 6 pages, 1 page front cover, 1 page editorial, 1 page SRD, 1 page back cover, leaving us with 2 pages of content, so let’s take a look! 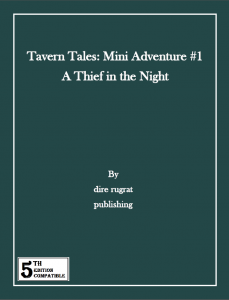 Wait, before we do: This mini-adventure can be pretty easily employed on its own, but its intention is to be run in conjunction with one of the taverns featured in Tangible Taverns: A Trio of Taverns, namely Blackberry Bill’s. In case you’re not familiar with it: Think former, gruff dwarven adventurer obsessed with blackberries who has a hidden location where they grow like crazy. The cast of characters, while depicted in sufficient detail to work on its own, is significantly enhanced if you do have the Tangible Taverns-installment, since the characters receive significantly more detail there. Speaking of which…it’s time to dive into this one and, this being an adventure-review, the following contains SPOILERS. Potential players should jump ahead to the conclusion. The PCs become witness to a little dispute, as famous eating champion Pie-Eating Pete is rebuffed by the server Braybin and blackberry’s stern gaze – once the pies are out, they’re out. The bully consequently storms off. The next day, Braybin finds the preserves missing from the tavern and, barring trails of a break-in, she suspects that someone has stolen her keys. This section feels a bit too autopilot/railroady for my tastes – who not let the PCs discover that themselves? Anyways, Braybin has two obvious suspects, the local scoundrel, her ex or Pie-Eating Pete, who has been hanging out with a local thug named Clyde. Pete’s room indeed contains one of the respective jars, but not the preserves, which, to me, makes no sense. If you move the preserves, why keep the jar after it’s emptied? Alas, this also extends to other components here – it is intended for the PCs to try to break into the Clyde’s place, which alerts the guards…which poses an issue. One, why not just ask the guards to check? Two: PCs are notoriously capable, so why is there no chance to evade setting off the guards? Inside the flat, only a nice (and sensible trap). Whether or not the PCs turn over Pie-eating Pete to the local authorities, his stats have been provided (commoner 7, just fyi!). Editing and formatting are decent on a formal level; there are some typo-level hiccups like “intimated” instead of “intimidated”, “track” instead of “trap”, “Pie Eating Pete” once with hyphen and without…you get the idea…the like. In contrast to the PRPG-version the 5e-version’s DCs are more consistent, though there is still an example where the respective check is not noted properly. Layout adheres to a printer-friendly two-column b/w-standard and the pdf has no artworks, but needs none at this low price-point. The pdf has no bookmarks, but also needs none – it’s only 2 pages, after all. If you want the cartography of the tavern, you need to get the Tangible Tavern-installment. I Like Kelly Pawlik’s story here. It could conceivably easily be run for kids and the change of tone from the usual fare is refreshing and nice. As a stand-alone, it does lose a lot, though not all of the charm the tavern evokes – in either way, plot-wise, it is a nice diversion. Let me correct that – I like the *idea* of the story here. Additionally, the conversion of the main antagonist and general checks/DCs have been done well…however, this does nothing to make the module flow better. At the same time, from a narrative point of view, this, alas, fails. The module tries to cram an investigation in two pages, which is hard; while AAW Games has successfully done this before, this pdf, alas, does fall into the trap that came from the obvious lack of space…excessive railroading. The actual investigation is basically taken care of for the PCs. There is nothing to be uncovered and, much like small kids eating pie, they are spoon-fed each detail; the two suspects are there from the get-go, really obvious and make the module, alas, feel like the equivalent of one of those annoying busy-work quests from computer roleplaying games: Walk to A, talk. Walk to B, talk. Stuff C happens. Challenge. Done. There is no internal variation and no player-agenda here, it’s a railroad in the worst sense, one that will make some players just say “Do it yourself!” to the NPCs. After all, they just have to walk over there and already know what’s up! The charming component of being a rather wholesome module further exacerbates the issue: When it could have been a light-hearted diversion, it instead feels like mundane busywork…even for kids. When used in its intended way as a companion piece to the tavern, it is a passable, railroady sidequest…though honestly, I can improvise a better, more open structure than what this offers. Ultimately, the use of this mini-adventure lies in its supplemental character for GMs who didn’t have time to prepare. The low price point also helps salvage this at least somewhat. Still, considering the high standards to which I have held similar mini-adventures in the past, I cannot go higher than 2 stars for this. You can get the 5e-version of this sidetrek here on OBS!